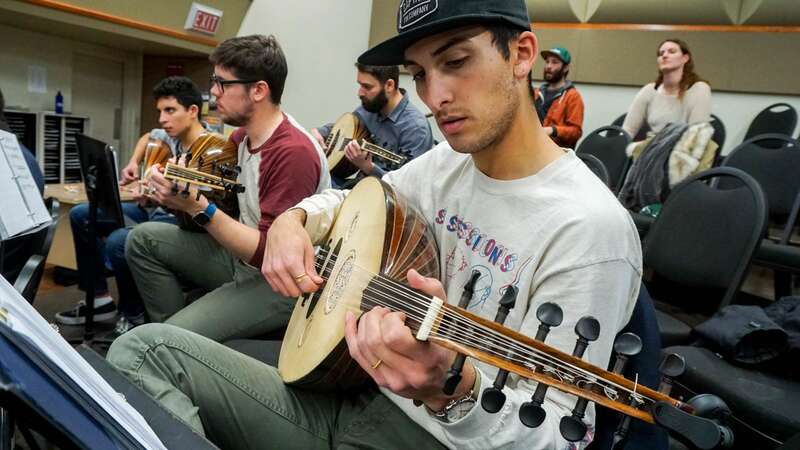 On Saturday, Feb. 24 at 8 p.m., the 12th annual Arab Music Ensemble (AME) will take place in the Performing Arts Center. The ensemble features an orchestra, a choir and traditional dances to braid together an enriching experience of Eastern Mediterranean music and the historically interconnected cultures of the larger region. Ethnomusicologist and Director Ken Habib has been working closely with more than 25 musicians and singers to perfect the melodic and metric modes from the genres of this part of the world. San Luis Obispo Dance Director Jenna Mitchell will lead dancers in choreography that interacts with the complexities of the music. The concert will feature guest artists Ishmael on qanun (trapezoidal zither), Fathi Aljarrah on kamanja (violin) and Faisal Zedan on riqq (tambourine), daff (frame drum) and darabuka (goblet drum). A variety of instruments such as these will be used to shape a harmonious sound that delves into the traditional music of the Eastern Mediterranean region. This will all be in quarter tone, which is a unique pitch characteristic of these genres of music. The exposure to instruments and sound that students may not be familiar with will contribute to the distinct journey through the experience of AME. “It’s out of the paradigm of Western European classical music, which is what the music departments in the United States historically have centered on, exclusively,” Habib said. Cal Poly music alumnus Brandon Webb noted the value of being exposed to a diverse variety of music outside of Western European classical music. Webb is the percussion section leader and is responsible for giving the drummers guidance and keeping a steady tempo for them. He will be playing the doumbek (goblet drum) as well the daff (frame drum). Despite the fact that some musicians involved with AME have not grown up with this specific kind of music, both those who are just learning it and those who have it weaved into their own roots can come together to collaborate in the ensemble. “The experience at AME is very divided between the people that want know more of the culture and the people that call this culture home. I know my fellow musician AJ and I have grown up with this kind of music and it’s something that we’re very attached to,” liberal arts and engineering studies senior Michelle Naziri said. Habib expressed that the AME has a following of people who have been attending the concert for years, some of whom also have this music embedded in their roots. He hopes the concert is sophisticated enough to resonate with this audience, but also transparent enough and multivalent enough to resonate with people who are hearing it for the first time. “The arts are an expression of reality in a way, just like the sciences are. We interact with our world … Human beings are intrinsically artistic. Music, for example, is, as far as we know, a part of every single society in the world and historically has always been a part of every single society in the world.” Habib said. The universality of music, along with the evidence of music as an essential part of history, demonstrates the richness of humanity, which Habib said we need to focus on by embracing our differences rather than being afraid of them. Regardless of musical literacy or experience, the AME said they hope the people who attend the concert will thoroughly enjoy it. “I hope that they enjoy the musical experience of being, in a sense, a musical person in society because everybody is musical even if you don’t sing or play an instrument, because we listen to it and appreciate it.” Habib said. Tickets are available at the Cal Poly Ticket Office with prices ranging from $12 to $14 for the public and $9 to $12 for students.